Kids will love Added Attention by Buried Treasure! Notes: This product is yeast, dairy, and wheat free. Liquid formula for easy swallowing. Recommended Use: Shake well before each use. 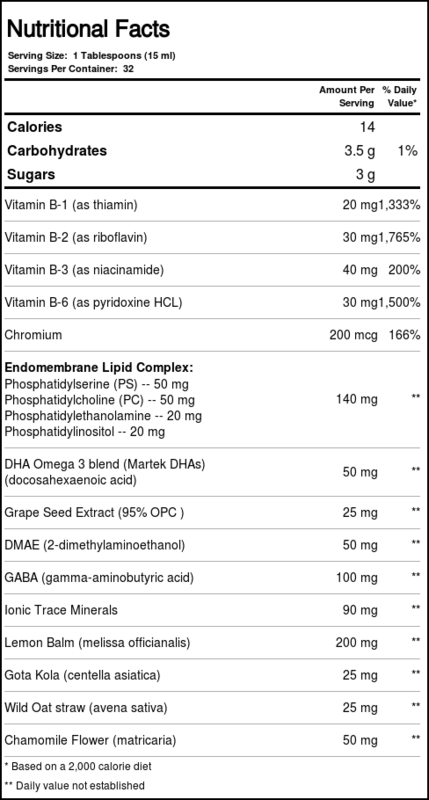 As a dietary supplement, take two tablespoons 1-2 times daily, preferably with meals. May be taken undiluted or mixed with your favorite beverages (for ages 4 years and older). 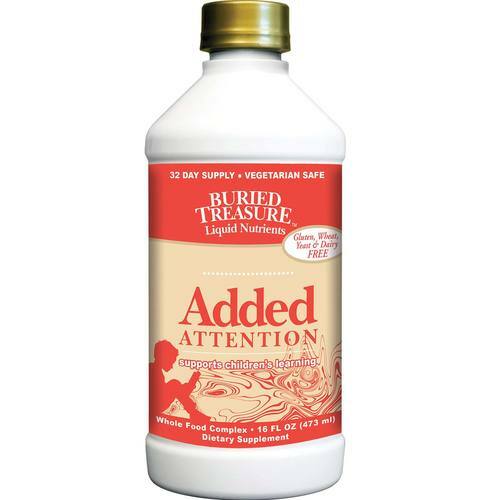 The customer reviews posted below are based on individual consumer experiences and may NOT necessarily represent what expected results will be from using or taking Buried Treasure ADDED Attention - 16 fl oz. These results may not be typical and you should not necessarily expect to receive the same results. Actual results may vary. I heard about this product and I started immediately. It was Friday and by Tuesday she was taking the FCAT (state test in Florida) 3rd graders will need to pass it or they will be held back. I totally recommend this product. She passed the state exam!!! My son is taking this with flax oil. Teachers have noticed a great difference. The only trouble I have with this is the ingredients. I have read that people with ADD/ADHD should stay away from grapes, sodium benzoate, artificial flavors, and sugars. That is all that is in it! Could the results be a placebo effect? I take ADDED Attention and I'm 45. I really do notice a difference in my ability to concentrate and focus, and I don't get the side effects that I got from taking stimulants for ADHD. I also don't find the taste bad at all - it's just very sweet juice to me, and for only a couple of tablespoons each day, that's not a big deal. I would recommend this for families looking for an alternative to medicines for ADHD, and as a mom to two kids with the same issue, I wish I had seen this sooner for them as well. All I can say is ADDED Attention has been the answer to my prayers! I will also say that I did see some results in my daughters' behavior when I took the wheat out of her diet, and when I added the Added Attention, I saw a huge difference. I noticed right away that she was less frustrated. When I would have her read to me before, she would get stuck on the third word and then just give up. Now she stops and sounds it out. She basically taught herself to read in a weekend. Just days later, and she's reading Dr. Suess cover to cover. Her teacher also has made comments that my daughter has been a "pure joy" in her class room, which was a nice change from the previous week. Best 20 bucks I have EVER spent!! I'm the mother of a ten year old and Added Attention by Buried Treasure didn't help at all. It was as if she was drinking water. My son is in kindergarten and his teacher said he is not focusing well. We gave this a try, just to see what happens. We just got a note today..... No problems with focusing anymore! We were so excited that I had to write. I can not guarantee it is this, but I sure am going to keep it going......we add it to juice in the am.